The other month I purchased a publication on-line from a large international organization. I am a fairly regular user of their services. They are well known as a provider of excellent books including texts, guidelines, and standards. If their prices are not cheap, generally they are fair and their shipping times are pretty fast. In the world of Quality it is pretty much the place for one stop shopping. I will say that in the past I have had some challenges with their marketing strategies when it comes to education and group purchases, but we were and are making progress in that area. Then about 2 weeks later I got an email request to complete a customer satisfaction survey. Probably like you, I am getting a little fatigued by customer satisfaction surveys. It is not that I don’t think they are important. I know they are an important component of the Voice of the Customer (VOC). If taken seriously they are an essential part of the continual improvement process of Quality. We don’t do them because ISO9001 requires them; if anything, it is the reverse. ISO9001 requires them because the Quality community advises that it is critical that we listen to the VOC. Anyways for a number of reasons I decided to follow through to survey completion, and that was a truly tragic mistake. I have written about satisfaction surveys in the past [see: Satisfaction. http://www.medicallaboratoryquality.com/2011/06/satisfaction.html and http://www.medicallaboratoryquality.com/2012/07/7th-rule-for-customer-satisfaction.html ]. The survey that they presented broke every rule in the book. It was forever long, tedious, complicated, and pointless. And if you decided to pass a complicated question, it bounced you back until you finally responded. It had to be one of the most painful experiences that I had undertaken in a long time. So what to do. The simple answer is to “X” out and move on. In all likelihood that is probably what 99 percent of the receivers of this particular survey do. But then I decided that since they started the conversation, that I would participate in the other side of VOC, giving Voice to the COMPLAINANT. Without going into detail, I found the name of the head of marketing and the president of the company and sent a missive informing them that I didn’t think it reasonable or appropriate that they punish their repeat customers. The chance of their ever receiving any useful information from this survey was zero. This was a survey designed by someone who gets some personal satisfaction in creating complexity with total disregard to the person at the other end. I know that some, perhaps all readers think this a waste of time. “X” out and move on, and the next time I receive another survey from this company just discard it too. End of story. But I will argue that if we are really committed to Quality as a valued process, then we have an obligation to go one step further. If we don’t let people know that we are not satisfied then we have not completed the cycle. We have stopped the conversation one step too soon. Someone once said that a picture is equal to a 1000 words. Can you measure complaints by a similar scale? I have been told that for every complaint you receive, there are at least 10 that were not received. I think that may be true, although I would suspect in the electronic era the number is a lot larger. In CMPT in our satisfaction metric we give each complaint a value of “negative 10” and each complement a value of “positive 1”. We think we learn a lot more from concern than from satisfaction. Compared to our internal audits, management reviews, and certification audits, complaints rank probably as our second greatest driver for review. Fortunately we don’t get all that many (maybe one formal complaint every 4-5 years) but when someone is angry enough to sit down and hammer out a complaint, the least we can do find out what is going on, and if the problem is ours and we can and should make adjustments, then we do. In any event, I have had a conversation with the president and was assured that my message was received, and that changes to the survey were on the planning table. My complaint has moved them to a higher priority. Bottom line. Asking for and listening to VOC is an important part of Quality. We do have some obligation to be a part of the conversation, especially when we are not happy. We live in interesting and in many respects a complex era. For the last 20 years we have seen a tightening of financial resources reaching crisis levels over especially over the last 4-5 years. Businesses have gone through considerable financial compression with tragic impact on persons and families. Governments have gone through a huge drop in revenues which as lead to cut-backs in funding of many programs and job loss. Healthcare has experienced all sorts of conflicting and compounding challenges; more expectation for services for groups with increasing need with particular reference to the very ill and increasing elder care. It is fair to say that healthcare is in the throes of huge and immediate financial pressure. That being said, Quality Management requires that medical laboratories maintain Continual Improvement though in part Continual Education. Thus despite the pain and challenges associated with the financial crunch, there is an obligation to education. We can do that in many ways, including journals, courses, local seminars, on-line education, webinars. And all of these work well. One can meet many, perhaps most of continual education needs locally and virtually. But I would argue that the in-face on-site conference still provides opportunities for education that cannot be met by the local or solitary experience. By my count, I can think of at least 7 which by chance (?) all begin with "C". Conferences bring together a group of like-interested people and put them in one room. They hear common message. They engage in common question, and they create common discussion. Adults have their own way of learning, but similar to children, adults learn better when they are isolated from distraction. Indeed the ultimate weakness of webinars and local meetings is distraction. Sitting in your office can be a private place to participate in a teleconference of an hour or two, but sooner rather than later, the phone will ring or there will be someone at the door. You may not get called away, but your focus gets pulled away. And it happens over and over. Imagine trying to participate in a teleconference for 12 hours. Not ever going to happen. The value of meetings is that people meet and discuss. Sometimes the discussion discovers polar opposite points of view; other times there is considerable cohesion and consensus. In many ways, the outcome is important and valuable, but never as valuable as the holding of the conversation. Many years, when I was a student, I was told: “Read a textbook to learn information from 3 years ago. Read a journal and learn information from 18 months ago. Attend a meeting and learn what is new information now.” Over the years my experience is that those values have by-and-large not really changed. There are all sorts of learning vehicles in a variety of formats, including blogs, and websites, and books, but few of them provide the same level of credibility of a in-face on-site presentation. Frankly anyone can write a block or develop a website or offer an opinion in a published book. Most of it is probably useful; some of it is not. But conference organizers tend to pick meeting sponsors because they see them as knowledgeable and good speakers. They may be biased and locked into a singular point-of-view, but with respect to their own information, they know what they are talking about. Others who are presenting papers and abstracts may be less reliable, but they are right there and you can ask direct questions. Either way, when you leave the meeting you will have more information than you had before. When like-minded folks convene, it is common that views for cooperation and collaboration on projects, present and future develop. Meetings often become the nidus of opportunities not yet explored. Continuing discussion and education often can spawn from meeting face-to-face and lead to all sorts of shared experience. It is so much easier to invite a person to talk to your staff at an education event it you actually know the person and what they are likely to say. You know who are the strong story-telling communicators and who are the thoughtful provokers. You find who have the folks with whom it would be enjoyable to interact and collaborate. So here we are. Meetings may take you out of the comfort of your office and may to one level or another be costly. There are always other choices, but no matter how you slice it, selectively chosen, there continues to be strong value in attending and participating in in-face on-site meetings. 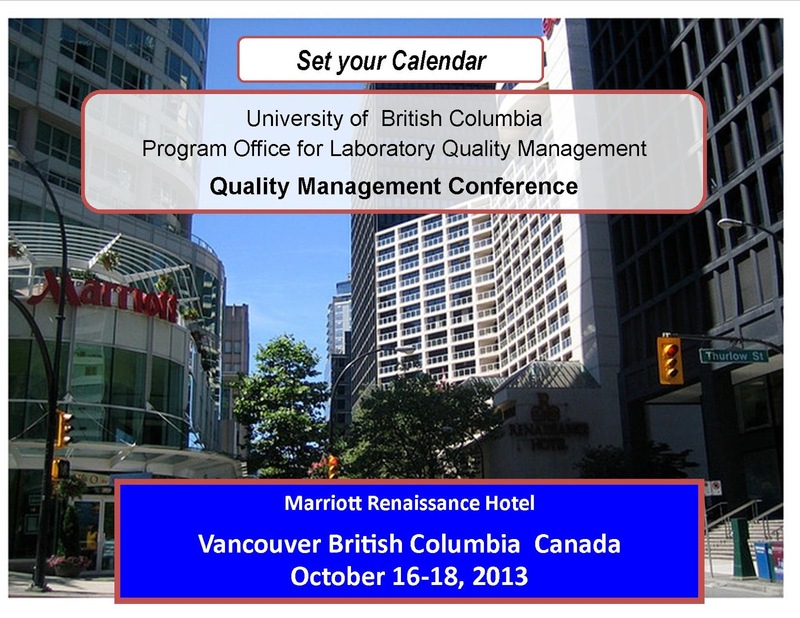 Labels: Conferences, education, Medical Laboratory Quality, on-site conferences, Quality Opportunities.